Buon giorno and welcome to Stefano’s RomeCabs, Rome’s leading company for quality and reliable Transfers to and from Civitavecchia Cruise Port, as we well as Day Tours from Rome and Shore Excursions from Italy’s main cruise ports. We are often asked by our clients what are the best ways to get from Rome to Civitavecchia Cruise Port. In this article we are happy to present to you the best ways to get from Rome to Civitavecchia cruise port in terms of convenience, quality, reliability, value and entertainment. On our private transfer from Rome to Civitavecchia you enjoy a direct non-stop transfer from your hotel accommodation directly to your cruise ship. Your personal driver will take you directly to the pier next to your ship for optimal ease, convenience, and efficiency. You will enjoy a comfortable drive in your private deluxe vehicle from Rome to Civitavecchia. Do you prefer the benefits of a private transfer but wish to also save money on your Civitavecchia Transfers? Thousands of cruisers have created their own Privately Shared Civitavecchia Transfers between Rome and Civitavecchia, sharing their transfers with fellow cruisers who are also staying in the same area of Rome to minimize excessive driving and keep fares for additional stops as low as possible. It’s very easy to do, you simply place an ad on Cruise Critic Roll Call, and invite other cruisers to share your transfers. Privately Shared Civitavecchia transfers are most recommended for transfers between Rome hotels and Civitavecchia, and from Civitavecchia to FCO Airport / Fiumicino Hotels. Privately Shared Transfers are NOT recommended for transfers FROM the Airport to Civitavecchia due to high instances of flights arriving late, luggage lost, and airport delays that would delay the other parties going to the Cruise port, creating uncertainties and stress. Our article below has all the necessary information to create your Privately Shared Civitavecchia Transfers. Turn your direct nonstop transfers from Rome to Civitavecchia into sightseeing opportunities on our Pre Cruise Tours from Rome to Civitavecchia that include pick up from your hotel accommodation in Rome, 4 hour tour of Rome or the Countryside, and transfer to your ship just in time for your embarkation. On our Rome Pre Cruise Tour you enjoy a visit to the Colosseum – the monumental ancient Roman amphitheater, followed by a visit to the Pantheon that was originally a Roman pagan temple later converted into a church in early 600’s AD, enjoy the lively squares of Spanish Steps and Trevi Fountain, and say a farewell to Rome with a spectacular panoramic view of the Eternal City from top of Janiculum Hill. 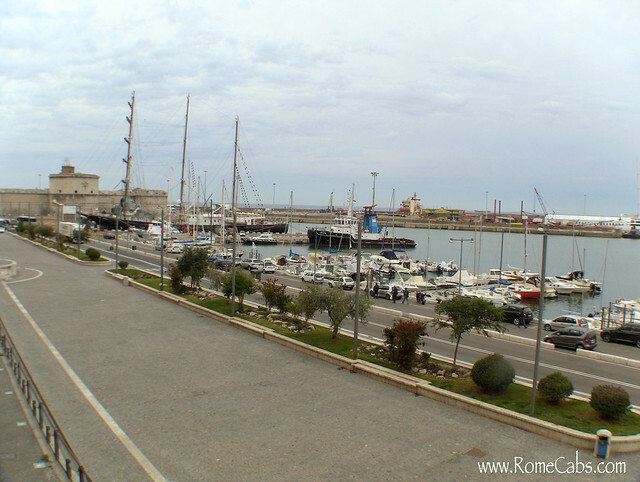 Your private driver will then take you on a scenic drive to your ship at Civitavecchia port. If you’ve already seen Rome and wish to further explore Italy on the way to your ship, you would love our Pre Cruise Countryside Tour that will take you to visit the imposing Renaissance era Bracciano Castle that overlooks the pristine volcanic Lake Bracciano, and enjoy a traditional lunch in Ceri – a Medieval clifftop hamlet that will transport you back in time a thousand years and delight your palate with the delicious homemade traditional cuisine prepared at local family owned restaurants that are famous throughout the region. After lunch, you will continue a short drive to Civitavecchia. This lovely countryside pre cruise tour offered by our sister company Stefano Rome Tours takes you to the same region of Lake Bracciano to visit the 3 charming lakeside villages of Bracciano (with an option to also visit the Castle), Trevignano and Anguillara. Lake Bracciano is a top destination for locals who wish to escape the chaos of Rome, and the historic villages of Bracciano, Trevignano and Anguillara will sure delight you with their beauty and charm. If you wish to SHARE your Pre Cruise Tours with other cruisers to share the fun and costs, you may also create your Privately Shared Pre Cruise Tour in the same way you may create your privately shared Civitavecchia Transfers. Place an ad on Cruise Critic Roll Call and invite other fellow cruisers who are in the same area of Rome as you pre cruise to join your preferred tour. For detailed information on Tour Sharing, click on TOUR SHARING below to arrive at the website page. Thank you for reading our travel blog. Please visit our website and browse through our Transfers and Tours options, and let us know how we can assist you in planning the best way to get from Rome to Civitavecchia Cruise Port.